In 2010, Heavy Rain arrived on the Playstation 3, and for a short time, the video game world enjoyed the novelty of putting on deodorant and using the toilet in a video game. Since then, the “interactive fiction” genre has caught fire, showing up in a wide variety of Telltale adventures, walking simulators, and even a The Longest Journey sequel. One of the latest entries into the minimally interactive adventure genre is Blues and Bullets, an episodic L.A. Noire style mystery set in 1950s America. It might be unfair to classify Blues and Bullets as a “me too’ game, but the first episode will feel very familiar to fans of The Walking Dead and The Wolf Among Us. Meanwhile, the game’s attempt at a unique visual style backfires. It's still early in the series and the story could develop into something special, but the first impression offered by Blues and Bullets is not overly promising. In Blues and Bullets, you play as Eliot Ness. Yes, that Eliot Ness, the one of Untouchables fame portrayed by Kevin Costner in the 1987 movie. In this largely fictional account, Ness has retired from law enforcement, and he now owns (or works in) a stereotypical 1950s diner. He is still a savvy detective though, able to tackle any tough case. One day he gets an unexpected job offer from his old nemesis, Al Capone, who has completed his prison sentence and now resides on the Hindenburg. Yes, that Hindenburg, which, in this fictional universe, never blew up. You have probably realized by now that Blues and Bullets takes extensive liberties with the historical facts from this period. It is a peculiar decision, since the game is trying to tie itself to the famous figures of the Prohibition Era, but the artistic license taken in this game is so bizarre and extreme that it might have been better off just inventing a new set of characters. The game features some mature and grisly subject matter, but it is hard to take seriously because its far-fetched historical revisionism spoils its authenticity. In the meantime, the game's strange fiction doesn’t add anything of value to the story. Perhaps future episodes will make these changes more meaningful. 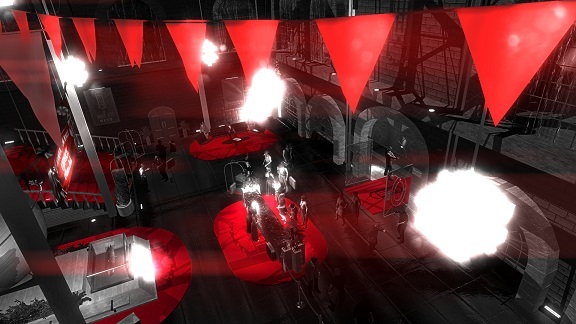 The basic gameplay for Blues and Bullets is standard fare for this type of adventure game. You move Eliot around rather small environments, examining objects and initiating dialog. With most dialog, there is are multiple options for each of your responses. "Threatening" versus "Charming". "Snarky" versus "Serious". You make a choice to drink apple juice or whiskey. You occasionally pick up an item and use it from your inventory. Beyond these basic elements, Blues and Bullets doesn't have much in the way of traditional gameplay. One manner in which Blues and Bullets attempts to distinguish itself is with its visual style. Perhaps in an attempt to remind you that this movie’s time period predates color films, Blues and Bullets is almost all black and white, with the occasional bright red highlight. It is the kind of style that might have felt fresh eight years ago, but since then a flood of Unreal engine games has already worn the grayscale color palette into the ground. The visuals are just boring and, if anything, they get in the way of you appreciating this portrayal of the era. 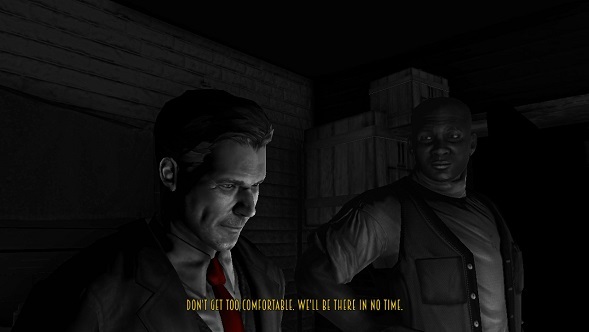 Technologically, Blues and Bullets uses modern 3D graphics, but with unimpressive results. It looks rather dated, like a 2008 Playstation 3 or XBox 360 game. Objects and textures look low in detail when you get close to them, and the faces in particular are usually quite ugly. The game also performs quite poorly relative to its visual quality – don’t be surprised if your rig that can run a cutting edge AAA game on Medium settings has trouble running this game on high. When you combine the game’s nonexistent color palette with all of its unimpressive art assets, you get a game that is mostly an eyesore. 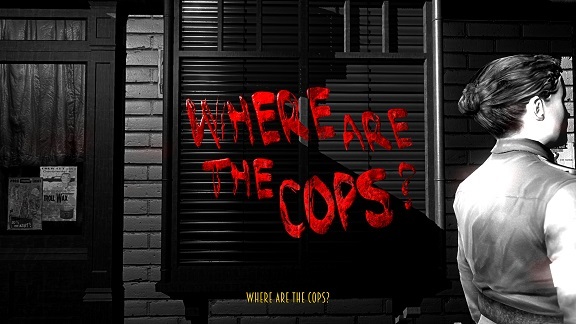 Other games in this genre have hidden their relatively modest budgets behind some quality art direction, and other games like LA Noire have made this time period attractive. Blues and Bullets fails in this department. 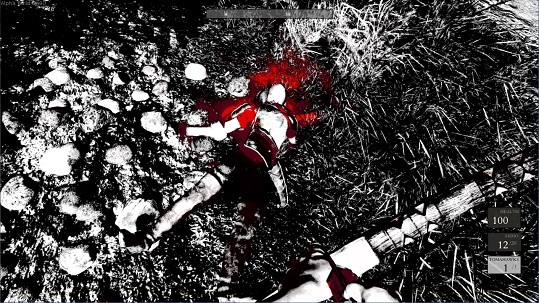 The other defining feature of Blues and Bullets is its L.A. Noire style crime scene investigation gameplay. At one point in your investigation, you discover a grisly murder scene, and then it becomes your job to scour the scene looking for clues. Once you find all of them, you solve a series of questions by matching up the appropriate clues with each question. For example, you may find some broken glass on the floor near a window, and one of the investigation questions would be “How did the attacker get in the house?” To answer the question, you match the broken glass clue with the question to determine that the attacker got in the house by breaking through the window. It is relatively simple, but there is at least enough to this gameplay to give you the feeling that you have some agency in the game. For what it’s worth, it does its job well enough to immerse you in the Eliot Ness role. There is only one such investigation in the episode though, which spends more than half of its time setting up its story. There are also a couple of brief cover-based shootouts in the game that are largely rail shooting sequences. They wouldn’t work in a genuine cover-based shooter, but in an adventure game, they function okay as part of the storytelling. For the remainder of this episode, you are experiencing what have rapidly become the clichés for this type of adventure game. You slowly (and I do mean slowly) walk through an area, clicking on the occasional highlighted item to inspect it up close or get a verbal comment from Ness. You initiate conversations with NPCs and make dialog choices. You can insult someone or be courteous. You can put a little bit of hot sauce on a hamburger or a lot. If this is not your first journey through this type of adventure game, then it will all feel like standard fare to you. Blues and Bullets does not appear to bring anything new to the table. Most of your choices ultimately don’t appear to affect the progression of the story since they are so minor. In most cases, the choice that you make only affects the line of dialog that you get in return, although there is one big decision that you make in the prologue which appears to have some effect at the very end of the episode. If you have exhausted your supply of interactive fiction, you can’t get enough of the film noir genre, or you have great interest in this time period, then Blues and Bullets may be a game that you want to check out. If, however, you have a stack of Telltale adventures in your backlog or nothing less than LA Confidential storytelling will satisfy you, then Blues and Bullets is a tough sell. It has too many bland elements in common with lots of other titles, and what it does uniquely doesn’t excel enough to make the game easy to recommend. Still, since it is a mystery series, it could pay off down the road if its “whodunit” aspect is satisfying. It is a series that you will want to follow though to see if the mystery that it offers turns out to be a good one.